It is important for us to be responsible Digital Citizens. Direct reference to outside sources should be made. 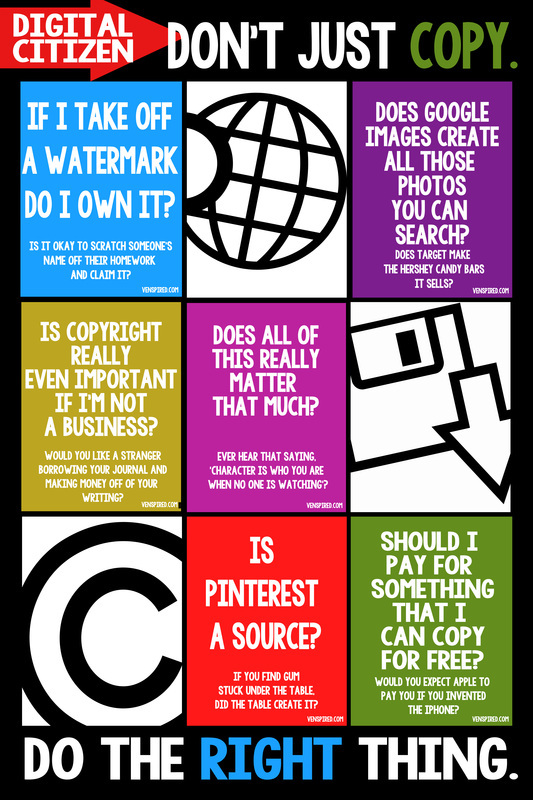 This means that all images and videos featured on this website have been retrieved using Creative Commons; Flickr Creative Commons, Wiki Commons, Creative Commons, and the like. All images have been labeled with Attribution and Share-Alike Licenses. Likewise, all references are provided when using direct and indirect quotes to avoid plagiarism. Plagiarism is the act of taking another person's writing and passing it off as your own (Dictionary). Copyright law must be followed in use of visual and written materials. Don't Just Copy. Do the Right Thing. Image Created by Krissy Venosdale.